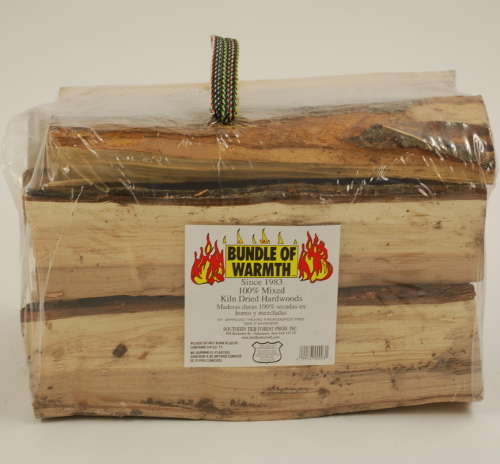 All bundled firewood products have an attached handle for ease of transport. The company’s mainstay for 30+ years, USDA certified hardwoods, 78/pallet, 13 X 6, 1716/Load of 22 skids. Weight is 23 – 27/lbs. each and varies due to mix of wood species. Wholesale Price: Call (877) 696-6060 for a shipping quote for 78 Bundles per Pallet and 1,716 per truck load. Or 60 per/pallet which is 1,680 per truck load. Great for large fireplace. They’re hardwoods only and light up fast and seem to burn hotter than the stuff I get from a neighbor. Great wood! Perfectly sized for fireplaces and outdoor campfires, this kiln dried wood lights up immediately. I love the forestry fragrance and it’s bug free properties are a real plus. I’ve ordered 3 times and will continue to count on this wood for my backyard campfires. I give this bundle Five Stars because it’s a good price and smells wonderful!